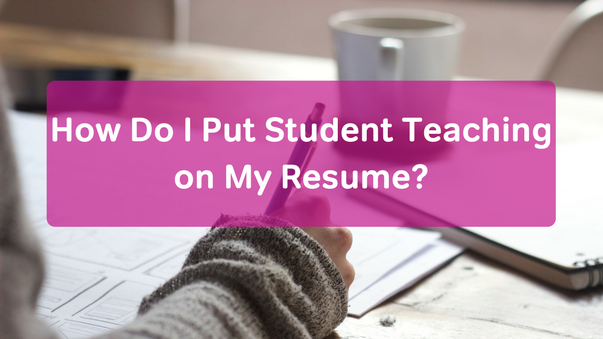 Student teaching is an important part of your work experience as an educator, so you should definitely list it on your resume. Of course, that might be easier said than done, so we've provided some tips and examples to help you! List student teaching under the “Relevant Experience” section of your resume (or something similar, like, “Teaching Experience”), rather than under the “Education” section. Make sure to include the school where you taught and the dates you taught. You also want to include the grade or subject area you taught. List a few bullet points describing your job responsibilities and accomplishments. Make sure to keep the formatting the same throughout your resume (so, if you list the date in italics for your student teaching position, make sure it’s also in italics for the other positions you list elsewhere in your resume). Student Teacher, 5th grade Social Studies, Middlebury Middle School, Middlebury, GA. January – May 2016. • Collaborated with coworkers to develop lesson plans. • Individualized lessons according to students’ interests, strengths, and needs. • Communicated with families in person and with a weekly newsletter. • Participated in parent-teacher conferences. Student Teacher, Kindergarten, Monroe Elementary, Glendale, Idaho. September 2015 – December 2015. • Implemented lesson plans for all academic areas based on Common Core curriculum. • Assessed students using Teaching Strategies Gold. • Participated in IEP team process and helped to implement individualized special education interventions. Practicum Teacher, 10th Grade Honors English, East High School, Portland, OR. Spring 2016. • Motivated students with innovative lesson plans. • Utilized technology including a SmartBoard and iPad into lessons. • Worked together with collaborating teacher and with the English department to plan semester-long and week-long goals. • Managed classroom of 30 students independently using positive behavior management strategies. Hopefully these examples give you an idea of how you can add your own student teaching experience to your resume. As with any resume writing, use active verbs to emphasize your role and accomplishments during your student teaching position. Remember to keep your resume to one page in length, and don’t forget to proofread! Good luck in your job search! And be sure to check out our tips on interview questions you should be prepared for, great questions to ask at your interview, and what to wear to your interview!